See it from far away we’ll find out if this motorcycle is a Yamaha Jupiter MX. But what makes her attractive is the glint of gold that mingle some body parts to look more ‘eye catchy’. 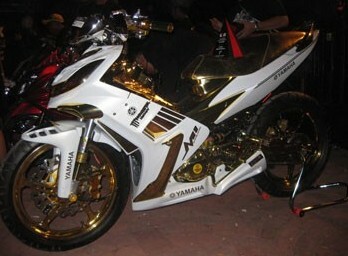 Motor mainstay Made Ambara Suarjaya, this SE is specially prepared to follow the event, especially in Denpasar MOTODIFY gold blinks class and ducks modification. Not only the body that received special attention, all the way to the legs also received special attention in order to appear more solid. Regarding the bike, Made Ambara the M1 service station manager also said, “This motor is Jupiter MX in 2006 that I kastem with the concept of the body custom elegant minimalist,” he explained. Although no extreme changes in engine, body looks great this is like a magnet capable of attracting more pairs of eyes to glance at him. Details of the front legs alone thick gold nuances like the chrome Gazi Fork Up Side Down and discs and 4 piston Kitaco KALIPER. To master brake and Tromol still using the original model. Continue to the rear legs, the changes apparent in the arm swing changes that also kastem model. Additionally there is the change in suspension using Gazi, Posh discs, 4 piston Kitaco KALIPER, and also the master brake custom version. Everything seemed to chime neatly with details from the body frame, front mask, fairing, the stern and the hood is the fruit Ambara Made creations under the label M1. As already mentioned above, although no change is in the machine, remove the motor tract is also redesigned custom model. For variations on this bike can be seen clearly in the use of X-1R handlebar, rear lights and sign Mio. For the gas pedal and Footstep, Made Ambara choose compact model output leading manufacturer of Yoshimura parts. 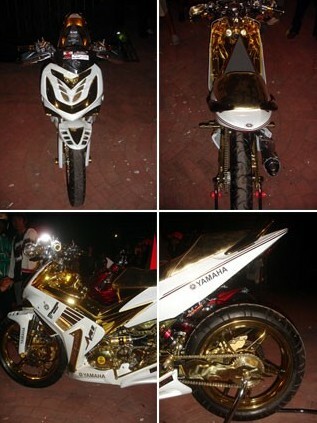 Prominent in the color, to paint and clear in the bike was handed over entirely to the shop wearing chrome Malik Bali william serwin products plus gold chrome on the outside. “Long processing this bike takes a month with difficulties, especially in sectors where we kastem body tries to tie fiber with plastic,” he reveals about the processing time and difficulty processing these motors. A row of these features are instantly made him a motor home so the best Denpasar, especially in the category of modification and the coolest duck blink-blink. Closing the conversation, the program reveals a friendly man on first impressions and expectations, “I am very proud and happy for this victory and I hope it’ll be more motor worked the front with a better one than now”.